The oldest botanical garden in the country, Oxford's enormous collection of more than 7,000 species of plants has been growing for four centuries. 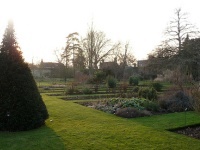 It was founded as a 'physic garden' by the Earl of Danby in 1621, but today the Oxford Botanic Garden's biodiversity is renowned for being even greater than that of a tropical rainforest. One does not, however, have to be a horticulturalist to enjoy the beautifully planted walled garden, exotic greenhouses, herbaceous borders, and rock and water gardens that make up this botanic feast - the plants are wonderfully arranged, and provide a memorable and calming aesthetic experience. An ideal site for a picnic, take the whole family along for an unforgettable day spent in immaculate natural surroundings.